According to General Manager Rod Graves, the Cardinals have started addressing some of their roster issues. Graves and Whisenhunt recently cited four players that are receiving the most immediate attention. They are Antrel Rolle, Karlos Dansby, Darnell Docket, and Anquan Boldin. Rolle is going into the final year of his rookie contract. He is scheduled to receive a $4 million roster bonus at the beginning of next month and more than $8 million in salary this season. Graves reported that they are currently working on negotiating an extension. Both Whisenhunt and Graves had high praise for Rolle. 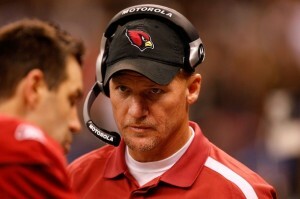 Whisenhunt stated that “this organization [tries] to keep the good football players, and Antrel is one of those. We are working on it, much like we did with Larry [Fitzgerald] in almost this same type of situation [in 2007].” Fitzgerald is obviously the face of the Cardinals’ franchise, so being mentioned as a priority similar to the stand-out receiver is quite a compliment. Graves has consistently stated that they will not chase Dansby if other teams shell out huge dollars. It seems, therefore, that the only way the Cardinals re-sign Dansby is if he doesn’t generate top dollar interest on the open market. This basically means that after they take care of everything else, Arizona will determine whether they have enough left to make a serious extension offer. If it isn’t “feasible” for Graves and the Cardinals to offer Dockett an extension before he hits free agency, the hopes of re-signing him would decrease dramatically. Based on Dockett’s exclamations that he deserves to be one of the highest paid defensive players in football, Darnell will most likely look for the big payday, wherever it may be. As for the often debated Anquan Boldin, Graves explained that the Cardinals will consider all the options, which include a trade, an extension or allowing Boldin to play out the final year of his contract; which is to say nothing we didn’t already know.